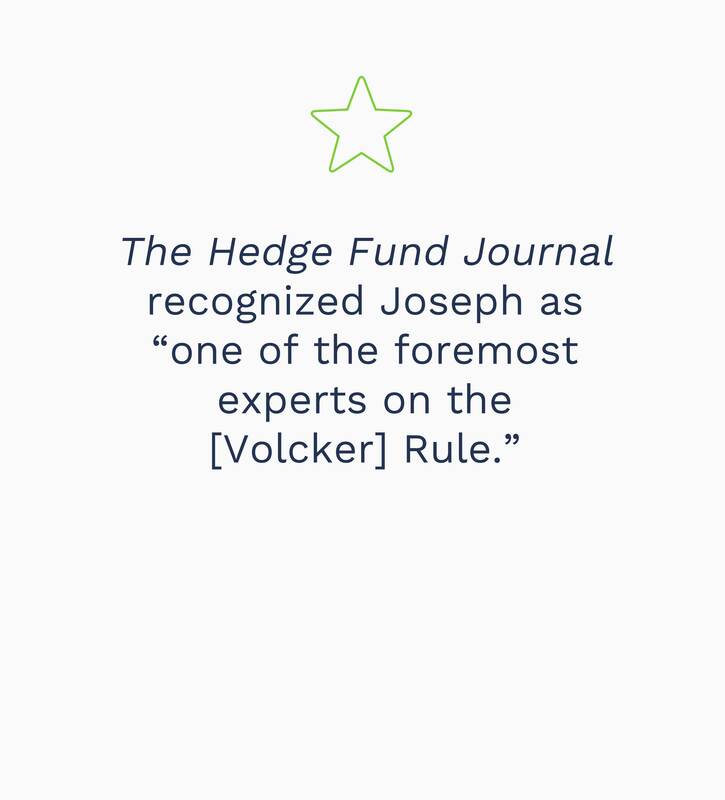 Joseph P. Vitale is co-head of the Bank Regulatory Group. He represents banks and other regulated financial institutions with respect to: chartering/licensing; regulatory compliance; mergers, acquisitions and reorganizations; financial transactions; formal and informal regulatory actions; litigations and claims; and legislative and regulatory developments. Joseph also advises parties, including private investment funds, seeking to invest in or acquire banks or other licensed financial service providers. Highlights of Joseph’s practice include representing the majority owners of GMAC in connection with the institution’s conversion into Ally Financial, a complex transaction that included a related $2-billion private recapitalization and the acquisition of $5 billion in public funds; and his representation of both the seller, Cerberus Capital Management, and buyer, TD Bank, in the $6.2-billion sale of Chrysler Financial, including obtaining more than 100 government approvals necessary to close the transaction. Joseph is admitted to federal and state courts for the District of Columbia and the State of New York as well as the U.S. Court of Federal Claims, where, among other matters, he co-litigated a breach-of-contract claim on behalf of a subsidiary of HSBC that resulted in a $96-million judgment against the U.S. government. Represented a private equity fund in the sale of 24.9 percent of a $600-million savings and loan holding company. Represented the lead investor in a $1.3-billion private placement of the common stock of one the nation’s 20 largest bank holding companies, a transaction that involved the approval of the Federal Reserve Board and the negotiation of a governance agreement with the company and the U.S. government. Represented one of world’s largest banks in the sale of an affiliated private equity fund manager with more than $9 billion of assets under management to the world’s largest asset manager. Represented a major real estate investment, finance, management and development firm (and one of the largest holders of distressed U.S. commercial real estate debt) in its $1.05-billion sale to the nation’s largest commercial REIT. Represented private equity investors in the recapitalization of a $375-million bank holding company located in Illinois. Represented private equity investors in the recapitalization of a $1-billion bank holding company located in California. Represented the largest shareholder of a $500-million national bank, in its sale to a $10-billion savings association. Represented both the seller (a private investment firm) and the buyer (one of the 15 largest banks in the U.S.) in the $6.2-billion sale of a national consumer finance company, including obtaining more than 100 government approvals necessary to close the transaction. Represented majority owners of a Fortune 500 mortgage and consumer finance conglomerate in its conversion to a top 15 bank holding company, including a related $2-billion private recapitalization and acquisition of $5 billion in public funds through the TARP. 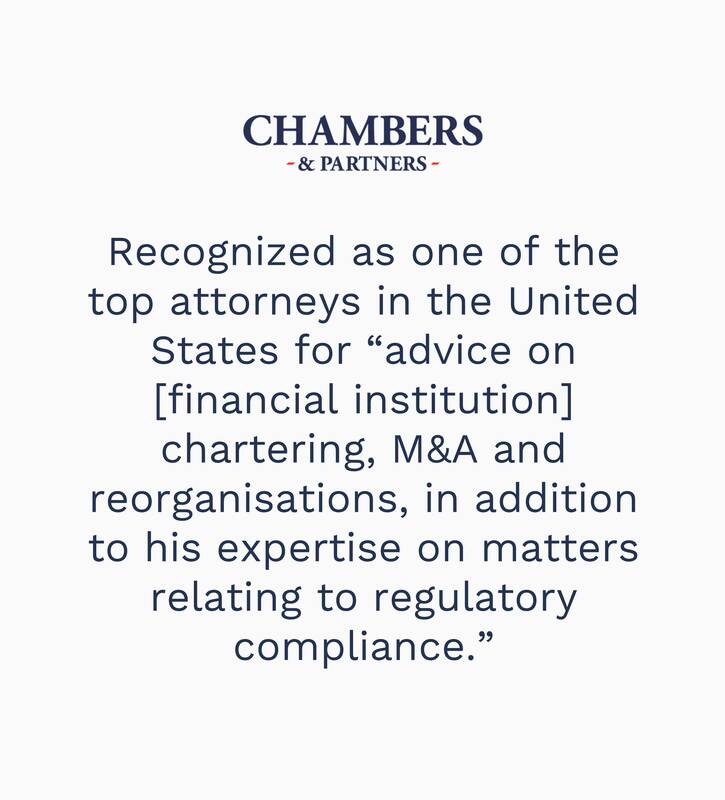 Represented private investment firm in change in bank control filings before the Office of the Comptroller of the Currency, the Federal Deposit Insurance Corporation and the Utah Department of Financial Institutions. Represented private investment firm in acquiring a significant minority interest in a federal savings association with branches in Florida, Maryland. Represented private equity firm in obtaining regulatory approval from all 50 states, and multiple federal agencies, in connection with acquisition of controlling interest in one of the “big three” U.S. auto manufacturers, including its licensed consumer lending and insurance subsidiaries. Represented private equity consortium in obtaining regulatory approval, including a special exemption from a federal moratorium, from all 50 states, multiple federal agencies and numerous foreign governments, in connection with acquisition of controlling interest in a Fortune 500 mortgage and consumer finance conglomerate. Represented domestic private equity firm in the acquisition of the Austria’s largest retail bank, with licensed operations/subsidiaries in the Czech Republic, Hungary, Malta, Slovakia and Slovenia. Represented group of private investment funds in the acquisition of a significant minority interest in an international bank holding company, with bank subsidiaries in Israel, the United States, the United Kingdom, Switzerland, Luxembourg, Romania and Jersey. Advised client on state and federal regulatory issues related to creation of a 50-state prepaid credit card and money transmission business. Represented private investment fund and regulated insurance company in the acquisition of a majority interest in an international reinsurance company with licensed subsidiaries in Bermuda, the Cayman Islands, Guernsey, Ireland, Singapore, the United Kingdom and the United States. Prosecuted regulatory applications for creation of nationwide Internet money transmission and payment service for Fortune 500 company. Served as primary outside counsel on regulatory matters for government-sponsored enterprise (banking institution) with over $80 billion in assets. Filed regulatory applications and conducted correspondence with Office of Thrift Supervision to arrange for approval of sale of major thrift’s Internet loan origination network and subsequent merger of two thrifts totaling over $8 billion in assets. Represented foreign private equity firm in the acquisition of the assets and business operations of a commercial lender licensed in the State of California. Represented numerous clients, including several Fortune 500 companies, in chartering federal banking institutions with Office of the Comptroller of the Currency and the Office of Thrift Supervision. Represented national Internet money transmission and payments business in the creation of its user agreements and related terms, conditions and disclosures. Drafted contract forms, policies and procedures, and other documentation for new lending activities of three government-sponsored enterprises with a combined outstanding loan balance of $178 billion. Responsible for negotiating and drafting derivative transaction agreements, representing over $1 billion in deals, for major investment fund firm. Drafted and updated standard agreements forming the basis for several clients’ secured lending programs, involving products such as term loans, letters of credit, credit lines, finance loans and sale-leaseback transactions. Successfully co-litigated breach-of-contract claim on behalf of former thrift institution in eight-week trial before U.S. Court of Federal Claims, obtaining a $96-million judgment against the U.S. government. Represented Fortune 500 secured lender in $4-million contract and commercial law dispute before U.S. District Court for the Southern District of New York. Represented major credit card bank in first-ever administrative appeal heard by Supervision Appeals Review Committee of the Federal Deposit Insurance Corporation and in related claim under Administrative Procedures Act. Represented trust bank in major investigation by New York State Attorney General’s Office, U.S. Department of Justice and Office of the Comptroller of the Currency involving alleged fraud and violations of federal rules on market timing and late trading. Represented Fortune 500 bank in settlement of major anti-money laundering action brought by the DOJ.